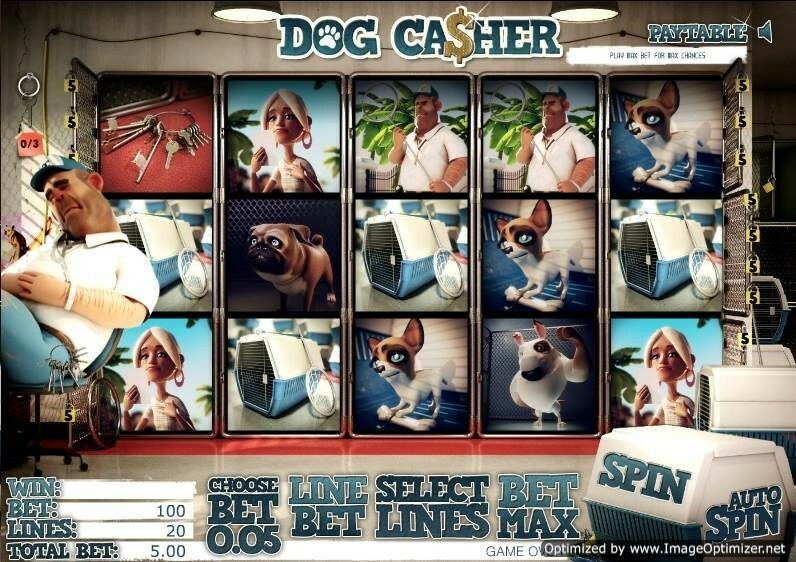 Dog Casher is a fun 3D video slot that has 5 reels and 20 paylines. This multi payline slot is full of high quality stunning 3D graphics with rich background sound effects and music. The game start with an introduction movie clip that tells the story of Cheri, a small dog that is surrounded by riches in a luxury house, but finds her self out in the street on day, where she is captured by a Dog Catcher. The Dog Casher video slot has over 21 different winning combinations in base play and 24 winning combination when playing the Free Spin and Bonus features. The majority of the reel symbols on this slot are excellent animated 3D quality and make a welcome change to the standard reel symbol design. The symbols include; Cheri, Cheri’s Owner, Dog Catcher, Dog Pound Keys, and the Dog Catchers Van. The Wild symbol is represented by the Dog Catcher and this symbol expands to fill the entire reel when activated. The Dog Catcher symbol also substitutes for the all other symbols (except the Scatter) to complete any winning combination. Dog Catcher has a pleasant continuous looping background sound track which is easily turned off by clicking on a speaker icon in the top right of the screen. The slot is full of incidental sound clips such has the Dog Catcher snoring and swinging his net, dogs barking and Cheri’s own sobbing! Rival have come up with an innovative new in-game feature called the ‘Click Me’ game. When 3 click me symbols, in this case the Dog Catchers Van, appear anywhere on reels 2, 3 and 4, you click on the icons to reveal prizes. Just keep clicking until you see the ‘collect’ icon appears. The Dog Catcher slot will suit both lovers of Penny Slots and High-roller slots as the coin sizes start at $0.01 and go right up to $5 with a maximum bet - per reel spin- of a massive $500.